While this was a quick fight, it was also an intense one that helped illustrate once more how eager the police are to enforce unfair labor practices and put the working class at risk of bodily harm on behalf of the bosses. 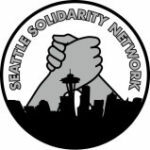 Seattle Solidarity Network is proud of how our members responded to the threat of police brutality as well as how strong and collected Karim was when faced with this blatant display of racism. If you are experiencing wage theft, discrimination, or other issues in the workplace or with your landlord then please consider reaching out to us at [email protected] or at (206) 673-6074.